Employed for both cosmetic and reconstructive purposes, breast implants are one of the most widely-used and controversial prostheses available. The development of safe, reliable products is vital to the future of this important field of surgery. 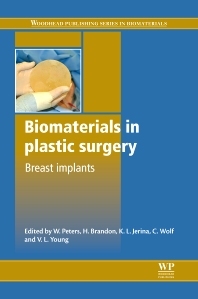 Biomaterials in plastic surgery reviews the history, materials and safety issues associated with breast implants. Beginning with an introduction to the history of biomaterials used for breast augmentation, Biomaterials in plastic surgery goes on to discuss development issues. It then discusses the chemistry and physical properties of biomedical silicones before reviewing cohesive gel and polyurethane foam implants. The book concludes by analysing the epidemiological evidence on the safety issues relating to breast implants, followed by a review of retrieval and analysis of breast implants emphasizing strength, durability and failure mechanisms. With its distinguished editors and international team of expert contributors, Biomaterials in plastic surgery is an important guide for surgeons, manufacturers and all those researching this important field. Walter Peters is Professor of Plastic Surgery at the University of Toronto, Canada. Harold Brandon is a Professor of Practice in the Department of Mechanical Engineering and Materials Science at Washington University in St Louis, USA. Kenneth Jerina is the Earl E. And Myrtle E. Walker Professor of Engineering in the Department of Mechanical Engineering and Materials Science at Washington University in St Louis. Clarence Wolf is a former Professor (now retired) in the Department of Chemical Engineering at Washington University at St Louis. V. L. Young is former Chief of Surgical Services at Barnes-Jewish West County Hospital, Missouri, USA, and is a founding partner of the BodyAesthetic Plastic Surgery and Skincare Center.